Puʻunēnē is a place name on Maui (pu’u means hill and nēnē is the native Hawaiian goose – “goose hill”.) It is the site of an early sugar mill built in 1901 and associated camp, as well as one of Hawaiʻi’s early airports. On June 15, 1938, Governor’s Executive Order No. 804 set aside 300.71 acres of land at Pulehunui for the new Maui Airport to be under the control and management of the Superintendent of Public Works. Inter-Island Airways, Ltd (to be later known as Hawaiian Air) constructed a depot; a taxiway and turn-around were completed and graveled to serve the depot and in 1940 Inter-Island Airways funded airport station improvements. During the time between June 30, 1939 and December 7, 1941, the civil air field was gradually enlarged and improved with some areas being paved. A small Naval Air Facility was established at the airport by the US Navy. Maui Airport became one of the three most important airports to the Territorial Airport System. Immediately after December 7, 1941 Pearl Harbor attack, the military took control of all air fields in the Territory and began the expansion of Maui Airport at Puʻunēnē. Army forces eventually concentrated on Oʻahu, leaving the Navy as the primary user of the field. An expansion lengthened and widened the runways. The northeast-southwest runway at Puʻunēnē was extended northerly to 6,000-feet and the northwest-southeast runway was extended southerly to 7,000-feet. A taxiway, 7,000-feet long, connecting the two runways on the east side had been built. Water, sewer, electricity and telephone lines had been installed. Certain related structures had also been erected. Under Navy control, the facility was renamed Naval Air Station Puʻunēnē, the airport served as a principal carrier plane training base. By the end of the war, Puʻunēnē had a total complement of over 3,300-personnel and 271-aircraft. A total of 106-squadrons and carrier air groups passed through during WW II. The demands of the war were such that the Navy found Puʻunēnē inadequate for the aircraft carrier training requirement and it was necessary to establish another large air station on Maui. NASKA became operational in late 1943. Air crews were trained at both Puʻunēnē and NASKA. The NASKA facility later became known as Kahului Airport, under the jurisdiction of the Hawaii Aeronautics Commission. Following the war, the Territory took back various airfields and converted them back into full-scale commercial operation of airports. In December 1948, the Navy declared the Puʻunēnē Airport land surplus to their needs and the airport reverted to the Territory under Quitclaim Deed from the US Government. No major improvements were made to Puʻunēne ̄Airport, as the plan was to move commercial operations to the former Naval Air Station at Kahului, which was considered much more desirable for commercial airline operation. In 1947, the Superintendent of the Territorial Public Works Department proposed readapting Maui Airport to the requirements of commercial aviation. Hawaiian Airlines Ltd., the only scheduled operator, had 496 schedules a month and flew a considerable number of special flights in addition. Non-scheduled operators averaged approximately 100 round trips from Honolulu per month. In December 1947, the Navy turned over jurisdiction of Kahului Airport to the Territory. By June 1950, Maui Airport was still the principal airport on the Island of Maui and was served by all scheduled and non-scheduled operators. Later in 1950, it was decided that certain parcels of land of the Puʻunēnē Airport be utilized to develop farm lots for the unemployed under lease arrangements with the Territory. Lots were laid out at the southeast end of Puʻunēnē Airport for use as piggeries. The decision to move interisland air operations from Puʻunēnē to Kahului was made on May 25, 1951. 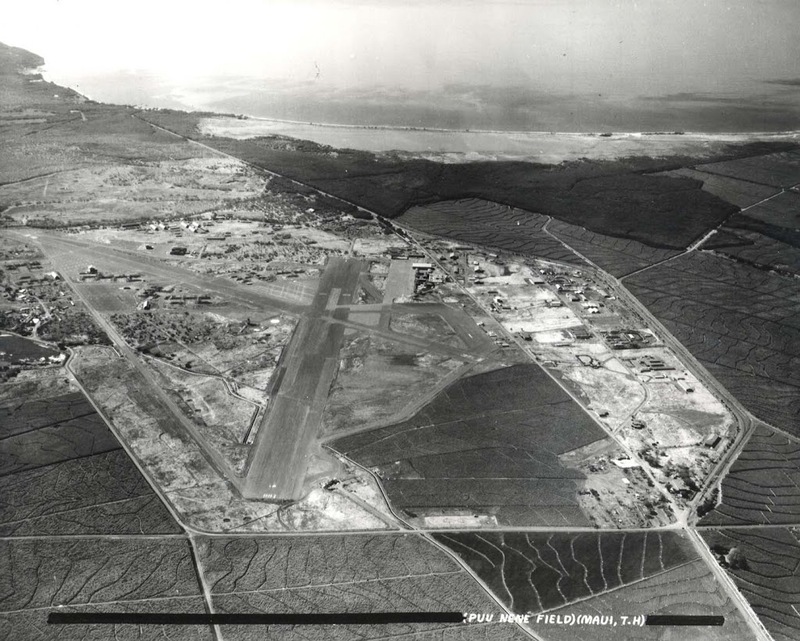 On June 24, 1952 all airport operations and facilities were transferred from Puʻunēnē Airport to Kahului Airport. The Maui Airport at Puʻunēnē was placed in caretaker status on June 30, 1953 and was closed to aeronautical activity on December 31, 1955. It was decided to use an old runway for drag races and time trials in May 1956; it remains in use as Maui Raceway Park as an automobile “drag strip” and park for such activities as go-kart racing and model airplane flying. The image shows Maui Airport (Puʻunēnē Field) in 1951. In addition, I have added other related images in a folder of like name in the Photos section on my Facebook page.